The Priorclave Q63 front-loading cylindrical chamber autoclave range provides laboratory managers with an alternative to the more expensive rectangular design. The cylindrical model can be manufactured at a much lower price, due to its simpler production process. However, despite this cheaper price, it matches other designs in terms of performance in the sterilisation process. When selecting an autoclave, customer decisions are highly dependent on the chamber size. Priorclave designed the Q63 to be taller than most cylindrical machines. 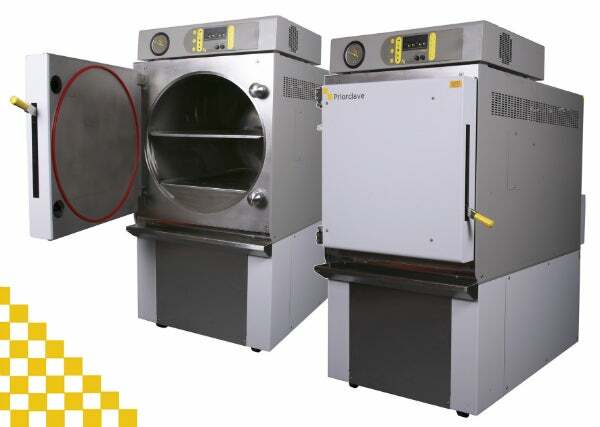 This gave its autoclaves an impressive load capacity, which enabled the sterilisation of both large and bulky items, and small and tall items in a single process. Currently, the 300l and the 500l models are available. Whilst offering increased loading capacity, a combination of features, such as automatic timed free-steaming for improved air removal, and forced air cooling to reduce cycle times, add to the overall sterilising performance of the Q63 autoclave. Users may also benefit from the lower overall running costs associated with reduced power and water usage. The company designed the systems with a focus on operator safety. They have a low, comfortable loading height, and many interlocks, which prevent the doors from opening at elevated pressures and temperatures. All operating settings are programmed easily using the advanced Tactrol® 2 microprocessor controller. This is standard across the whole Priorclave range and the controller can be configured to log all temperatures, pressure times, and cycle data into a single compact archive file, which can be later downloaded onto a USB flash drive for transfer to a computer. This system enables operational data to be accessed by Priorclave’s UK Service Center, for technical assistance from anywhere in the world. The Q63 front-loading autoclave range includes epoxy-coated frame members and panels, which are treated with an anti-bacterial agent. This is highly effective against all fungi and bacteria, including MRSA, preventing cross contamination within laboratory environments. Q63 autoclaves are part of a wide steriliser range that includes benchtop, and top front-loading machines, as well as power-door and double-door models. Each and every model is manufactured in the UK and follows a precise design and build programs, conforming to either the Pressure Equipment Directive (PED) or the American Society of Mechanical Engineers (ASME) standards, depending on which country the product will be installed.